Chooki’s eyes had been vacant and remote for days, their absence of expression revealing that the spirit of life that always had suffused her so delightfully had already begun to take leave. Perhaps she knew this was her last day and she was ready to go and be spared the pain of her arthritis, and her huge ribcage-clinging tumors that must have made sleeping a pain, and her dry skin and her thinning flesh that no longer provided a cushion against the oak floor boards or even the rugs, and those back legs that collapsed like silly putty, sometimes bringing her down in what seemed like an embarrassed state of helplessness. Then she would look at me and I’d wait a moment to see if she could right herself (which seemed to be what she preferred) and if not, I’d go over and slowly help her up but that was awkward and painful for her also. Janet came home from town around 1:30, cooked an egg, and joined me on the floor with Chook until Jane arrived with her small bag of medical supplies. I met her in the driveway with tears flooding my eyes and she hugged me warmly. Inside the house, she hugged Janet and said something like Chooki is probably relieved I’m here…but I’m sure you guys must feel otherwise. I tried to stay close to Chooki but got up from moment to moment so she wouldn’t hear and see my wailing. Jane explained she would give Chooki a muscle relaxant first, which Chook tolerated fairly well until the very end of the sizeable injection and then whimpered with pain. It took several minutes for that to have its effect. Her tongue, as Jane had predicted, kept slipping/flipping out of her mouth involuntarily it seemed, a tongue now very creased and grayish-purple. And when she was finally at peace, Jane injected the toxin that took her life. Soon thereafter Jane checked for a heartbeat with her stethoscope and confirmed she was dead. Her death amid all the sadness Janet and I were going through from our divorce was for me overwhelming and must have been for Janet as well. To concurrently be terminating your marriage and also loosing your dog was a ramrod punch square to the heart. Jane helped us carry Chooki in a sheet and a white blanket to a rusted, rickety, flat-tired wheelbarrow that Janet had previously positioned outside the kitchen door. A half-hour earlier, Chook had been a dear sweetheart of a dog struggling to walk and pee and poop on Crittenden Street and now she was a lifeless mass of unkempt hair, lifeless organs, useless bones, and remnants of bumpy flesh and flaky skin. The miracle of life one moment…and in a heartbeat later, the pain and finality of death. I pushed the moaning, slothful wheel-barrow over the just-greening bumpy lawn and winter twigs and pulled it up alongside the grave that Janet and I had dug the day before behind the Azaleas toward the rear of the garden. It was a grave with neat vertical walls and a shape in between a circle and a trapezoid. I had marked two bamboo sticks with red ink to establish Chooki’s length and width and our calculation as to the grave size had been right on the mark. After lifting Chook in her white shroud out of the shallow steel pan of the barrow, we carefully set her down in her final resting place. Then I sat on the earth with my feet in the grave and cried and cried. Finally I rose and we began to shovel soil into the gap of a few inches between her wrapped body and the sides of the grave. When the soil reached the top of her body we sadly shoveled the remaining dirt on top of her and returned her to mother earth. We finger-raked sticks and stones from the mound and went into the house, where we sat mournfully, mostly in silence. Janet looked so much like Virginia Woolf, a resemblance I had remarked about throughout our marriage. I’m sure she was already figuring what lovely flowering plants she would set in around the grave. The wanting silence that engulfed us eventually succumbed to a few tries at conversation and then, save for one moment uncomfortably connected to the topic of our divorce, we spoke for at least an hour in a manner that reminded me pleasantly of old times. 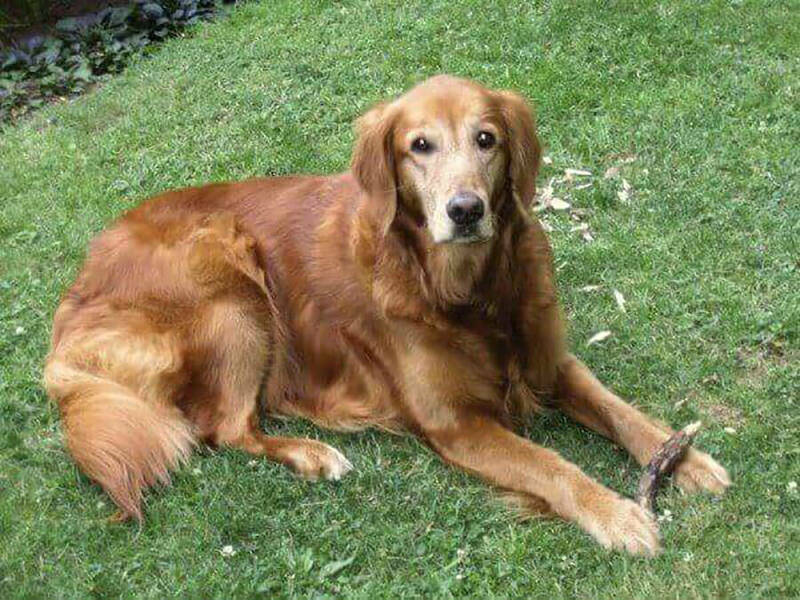 It was roughly fifteen years ago that a woman walking her dog near my office in Chestnut Hill informed me where she had acquired her dog, also a Golden that later turned out to be Chooki’s brother. Her brother was a large dog and too rambunctious for Chook to play with as a friend. Both dogs were bought from a family living somewhere around West Chester. They raised Goldens in their house for sale. The family, which home-schooled their kids, called the dog we had selected for our pet Princess because she seemed to be a bit aloof compared to her rough-and-tumble siblings. She sat separate from them, quite regally erect, with head raised and looking like she was pondering deep philosophical questions known only within the inaccessible realm of dogdom. We almost didn’t get Chooki because she had a pronounced bony bump at the back of her skull and I was concerned that bump would trouble me aesthetically as time went by. Yes, I know what you’re thinking . . . weird and shallow. But she was so warm, so immediately affectionate, so wise (but not super-smart like a poodle) but wise in a calm way, as a Princess might be calm, and centered, and knowing. Outside, on the family’s lawn, her mother romped and tumbled very roughly with the pup we were about to take from her, racing around and crashing down on top of her Princess. I thought the bones of poor Princess would be broken. I never saw a mom so ruthlessly wild with a puppy. Once in my car, Janet held Chook wrapped in a blanket. As we raised the car window that audibly separated Princess from her mom, the poor baby started to shake violently. As we slowly drove off, no amount of comforting touches and gentle utterances were enough solace. But once home, it wasn’t long before she was happy to be with us and she soon settled right in. Then came the name search. We had a list of about 15 names; a list I know I have stored somewhere in one of my many folders of memorabilia. Unable to settle on a name that seemed to work, we asked Aida, who had come to the US recently from Bosnia as a refugee, what they called a dog in Bosnian. Cuki, she said. It meant mutt. It sounded like the perfect English name for a pet, our pet, so happily she became our Chooki, and/or Cuki. Unruly and full of the devil in her own exuberant way, I never thought Chooki would be a dog that could walk off leash, but I worked with her on my morning walks and she eventually became reasonably obedient save for the moments she would see a cat or a squirrel and fly off in pursuit, racing like the hunting dog true to her nature. Helpful in my teaching her were two excellent dog-training videos I bought on-line called, ‘Woof,’ and “Woof-Woof,” narrated by a guy named Manny. (I believe they’re still available for purchase). One day I was walking with Chookie down Crittenden Street and I heard a humming sound…well, more like a buzzing sound…almost a rapid-fire, tool-like ratcheting because it was quite loud, but also slightly muffled. I looked around for the source and she looked at me with a sly expression. It would be minutes before I realized she had cocooned a cicada in her mouth, holding it gently like the way the whale might have held Noah in its gullet. If she had been able to smile like our previous Golden named Sly, showing her teeth with her lips curled back, I’m sure she would have done that but instead she just walked with a proud step, facing straight ahead, and continued to enjoy the noisy, brittle tickle in her mouth and my appreciative chuckle. Janet and I will always remember our walks with Chooki in the Wissahickon as she pulled relentlessly on her leash and sniffed every urine soaked weed. The luxuriant smells of ducks, and vegetation, and horse manure, and fern-filled bogs brought her to life like nothing else. Although she loved to de-bark sticks bracketed between her paws, she was lukewarm to running after tennis balls and never got the hang of it; it just wasn’t an activity right for a Princess. As our neighbor and friend, Peter Jucovy, observed in an email to me, “She was indeed a grand princess in spirit and manner, and her quirks — her triumphant marching down the street with the prize of a tree branch in her mouth, her headlong route to the human when a dog and human pair of friends were approaching, her tender and soulful expression — are indelibly etched in our minds as emblems of her noble stature and loving disposition.” When Peter mentions a tree branch in her mouth it actually doesn’t do justice to the absurd length of the branches Chooki would pick up. They were oftentimes sixteen to eighteen feet long, requiring me to guide her along the yellow line, down the middle of the street, and adequately far enough away from cars that car doors weren’t scratched. She never learned to go to the middle of the branch to balance it, but persistently headed for one end dragging it along clumsily until she learned to wait for me to roughly center it in her mouth so she could prance with pride as if she were bearing a fully racked moose head rather than just a sycamore or oak branch. Chooki could swing from foolish bravery to cowering with fear in a matter of moments. Once, in her youthful years, as we walked along Roumfort Road, she heard a deep bark coming from behind a privet hedge and decided to romp around to what she imagined to be a new playmate on the lawn behind the hedge. A Great Dane, leashed to a stake, thumped her to the ground and proceeded to do her in. We ran to her rescue as she yelped and cowered and endeavored to adopt every belly-facing-sky pose of submission that instinct brought to mind. Like many other animals, Chooki shook in fear whenever she was taken to the vet and couldn’t wait to get out of the place when her exam was over. She had a few serious operations, one that was life-threatening to remove a cancerous growth on her hip and another on the lower lid of one eye. We also had to rush her to a 24-hour emergency hospital in Langhorne when she was dehydrated and near death. After days of tending to her with critical-care services, she managed to survive; a close call with death marching closer — way before her time had come. Lightning would drive her crazy and her heart would race, her panting tongue would droop out of her mouth at full extension, and she would wander the house looking for safe haven behind the bed, sometimes upsetting furniture in her frantic search for refuge. No amount of loving and hugging could quiet her save for a segment, or two, or three of her anti-anxiety tablet, which she willing allowed us to finger down her throat if we had to give her a dose in advance of the first loud boom. She could smell the distant barometric change in the weather or could hear the thunder booms a city or two away. She’d look up into the swaying trees and darkening skies and shoot you a fleeting glance that gave notice that the world was coming to an end. Sometimes she’d refuse to go out during a storm even though we knew her bladder or bowel was about to burst. She had to be dragged into the rain and as soon as her business was finished she’d make a bee-line for our front door. Much as I tried to teach her to shake her coat free of rain before she got into the house, she resisted with childlike stubbornness until she was inside and then she’d shake like hell, requiring us to ‘mop’ up with one or more towels. She also loved to be towel-dried after the mop-up and the activity usually concluded with some playful growls and a pull on the end of the towel to encourage a ‘fight.’ Year round, she loved to drink cold water out of stainless steel bowl that Janet kept freshly changed just outside our front door. During hot summer days, she loved to lie on the cold slate ‘landing’ just inside our front door, her hot breath condensing in a flare of moisture just beyond her panting open mouth and heaving chest. Chooki lived to be the oldest Golden Retriever in the history of our vet’s practice (15 years and three months). She didn’t respond to our cats who liked to pick fights with her and yet she’d protected them out on the street, coming between our cat and an aggressive approaching dog. At night, she loved to share a bowl of popcorn with me, but could be an annoying nudge at times because she never could get enough pats on top of her pointy head. She learned to wait to go to her bowl of food until she saw the correct hand signal, and until the word OK was uttered. Chooki was a dream of a pet and had a heart made of GOLD. PS-1: About a week after Chooki was laid to rest, Hal, a neighbor came over to the grassy circle of our cul-de-sac where I was uncharacteristically sitting under the trees at the picnic bench reading. His dog, Ginger, was with him and the two Goldens used to play together until Chooki concluded Ginger’s puppy friskiness was a bit too much for Chook’s wavering back legs. Hal expressed his condolences as Ginger stood by my thigh and poked me with her nuzzle as Chooki used to do, prompting me to pet her. It’s funny how (at least for me) an expression of condolences brings forth a tearing eye. So I lowered my eyes in embarrassment and looked at Ginger, who, with her whitening muzzle looked just then so much like Chooki. Then I was suddenly overcome with an otherworldly sense that Chooki had come back to life and was there beside me, looking up at me with those soulful eyes, Ginger’s soft coat feeling so much like Chooki’s. I’m usually not one for mystical experiences, but in that vulnerable state I was in, I could have sworn that Chooki had come back to life and changed places with Ginger. I was overcome by emotions, which had been heightened in recent days with all forms of loss that come with an imminent divorce. I could only bear a few more moments of petting and looking into the eyes of the Chooki spirit and then Hal knew he and Ginger better walk back into the house before I fully crumbled. PS-2: It’s near the Memorial Day weekend at the end of May and I’m here at my desk taking care of bills and assorted mail and in my inbox was an unusually proportioned (near square) envelope with no markings on it at all. As is my habit, I figured I’d save it and use it some day to mail perhaps a photo to someone. I hate to waste paper. Quite by chance, I looked into the envelope and there at the bottom was a clipping of Chooki’s hair that Janet had snipped off after the vet confirmed that Chook was dead and thoughtfully placed in the envelope as a remembrance. I carefully slid the fine clump of hairs up where I could see them better and the tears welled once again. Dead she was but here was something of her from when she was alive. It was almost as if she had come back to visit me. I sniffed the tassel of golden hairs with its slight tapering curl at the end hoping I could smell something of her, but it was disappointingly odorless. The hairs were so fine, so strawberry blond in a human way that they looked like a snippet of my old girlfriend, Harriet’s lock of hair. I’ve realized Chook is still so much a part of me in a living sense. When it thunders, I worry about her anxiety. When I go to Janet’s to pick more of my belongings, I think for a moment she’ll come running to the door or lie on the cold flagstone landing just inside the door looking up at me with those soulful eyes asking with her expression why I chose to leave…or why I had to leave. So, after I carefully let the tassel slide back into the envelope, what do I do with the envelope. Do I start a new file called critically important and irreplaceable things to save. That I’ll do so that I can visit what’s left of her from time to time. Visiting what’s left of people, places, and things no longer with you is a sorrow-filled but poignant component of loss.